So after much thought I’ve decided to put down what i’ve been working on for the last couple of months. One thing we (wife and myself) have always been interested in home automation. Now that we are proud home in owners now is my chance. After poking around and reading about X10, (which has been out for over 20 years), I was a bit sad to see that it not 100% reliazble, and I didn’t want to run into the many problems. Even after to many years out. X10 works, basically by using the existing power lines to send messages, sounds simple right but here is the catch. And many devices you can find on ebay extremely cheap!. 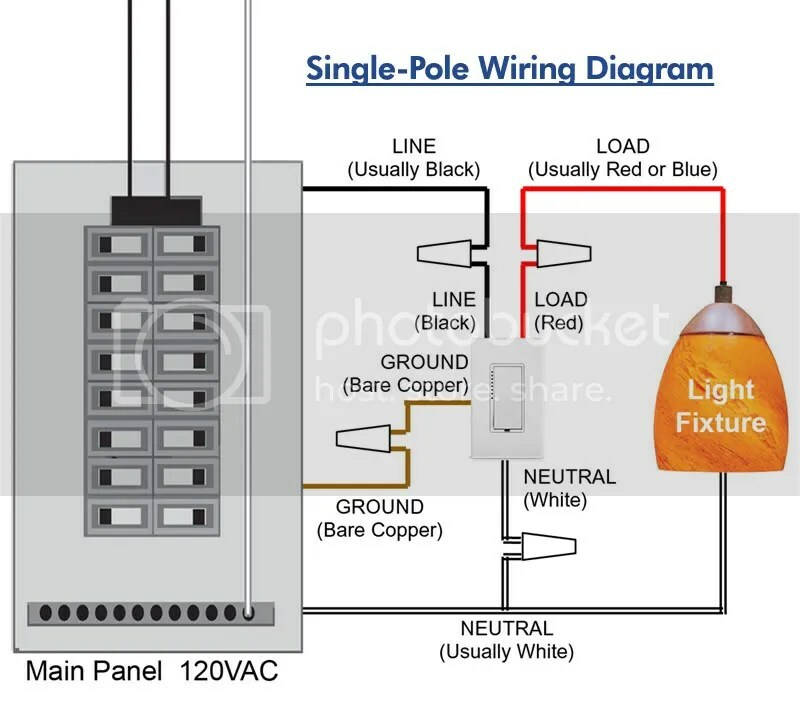 But as usual there is a small little detail, many home have 2-110v legs going into the home , so MANY,MANY times it wont reach its destination and eventually work sporadically. Sure, there are fixes and other ‘patches’ but at the end it sounds like 1000 gadgets to have a simple switch working, and when you have many components like that something is bound to fail sometime. With the couple of X10 devices I have troubleshooting that is a nightmare. Not to complain but many x10 switches arent really a compelment to a room, and I was not looking to worsen the look of the switch. Which is what I wanted to avoid, but don’t be fooled its not that x10 is bad and I have used it for a couple of good things which you’ll see here. So in comes Smarthome, and I was reading how their technology called Insteon, uses the PowerLine and “RF” to talk to devices, and better yet, each device acts as a repeater, so in theory the more you have installed the better your network gets! (This has proven true in my case) . But since it’s around 3 years old, new products are still being made, but as mentioned before its still compatible with the older x10 technology so you can get great gadgets such as remotes for like $4 on ebay!. 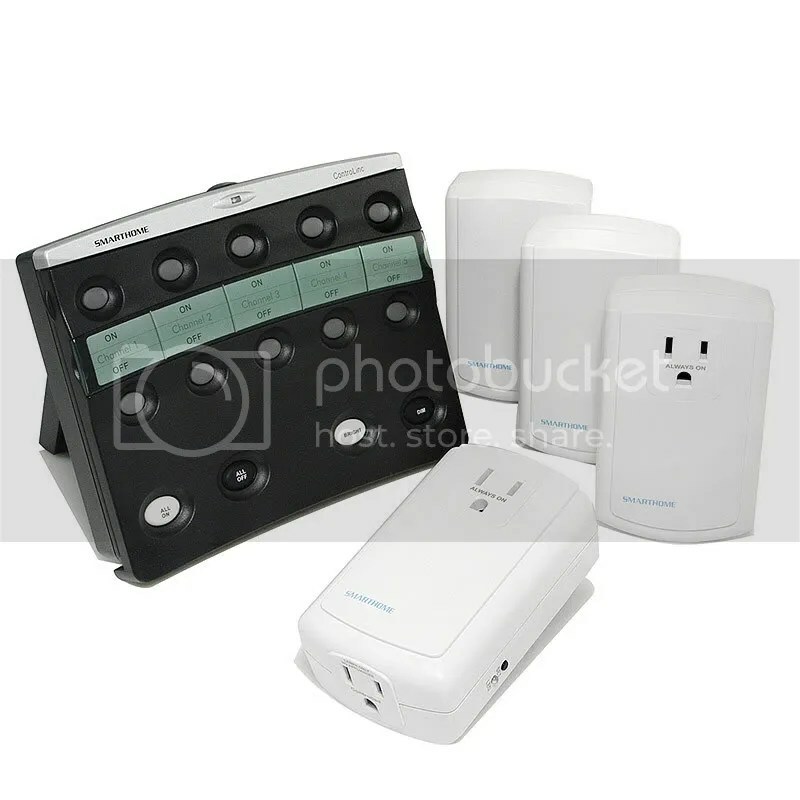 My first starter kit was a outdoor lighting set I purchased called FreeWire which was Black and decker’s take on x10 for less than $40, which contained a couple of lamp dimmers and a simple table remote. The way you configure “x10 devices” is you have a “House” code which run from A-P and a unit code from “1-16.” And you assign your devices on one of those two. Neat, and simple! Inmediatly I found that plugging in the base into one ‘leg’ of the house it wasn’t able to power up one of the modules. (Damn.. just what was reading about…) oh well it still gives anyone a good start. At least I got some good outdoor modules which are rain proof. 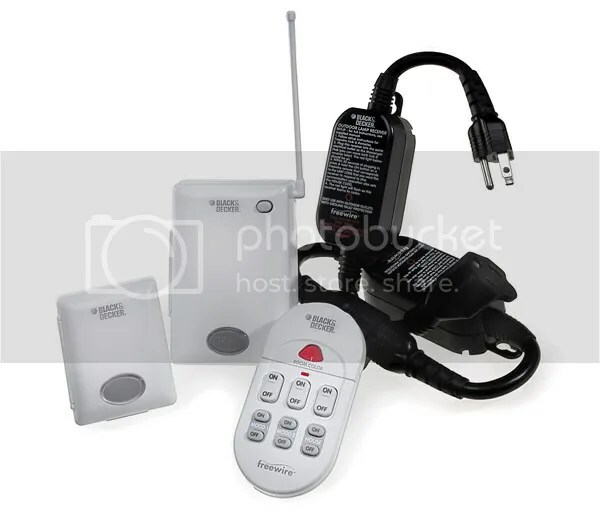 Kits comes with the desk remote, two lamp dimmers and two couplers. Installation was a breeze, no how codes, no #1-16. Basically you tap/tap to configure them, each devices has its own memory and mind. You keep one pressed until it flashes and walk to the one you want to control and wait for it flash and presto!! Better yet once you install the two included couplers I had no problems installing the devices and reaching them anywhere in the house!! This was so easy I first did our bedroom, no more need to jump off the bed to turn off the light.! I even got an additional controller off ebay for $25. New at this time of writing go for $34. Worth each penny. 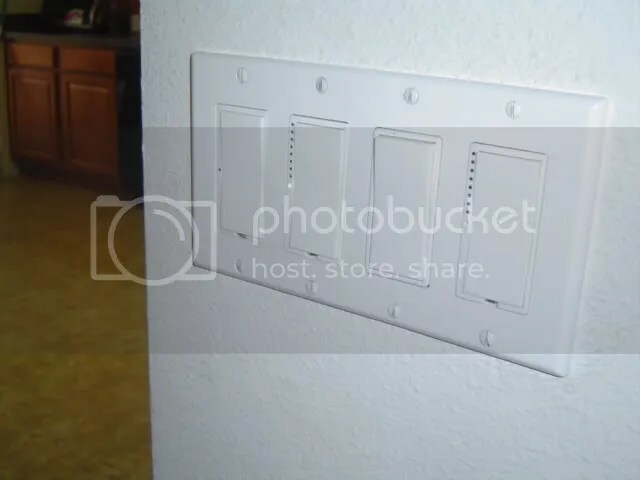 So I’ve little by little i’ve gone ahead and changed the switches of the house and hopefully make life a little easier. Right now there are two types of switches out there, what I call the expensive (Smarthome ) and the not so expensive ones (Icons). I love both of them and both come in Dimmer and on/off format. Below you can see from left to right, the first is the Icon On/Off switch followed by the dimmer, a regular on/off and another Dimmer. A couple of weeks go by and its very cool to be able to turn off a light switch from a remote. But I wanted more! 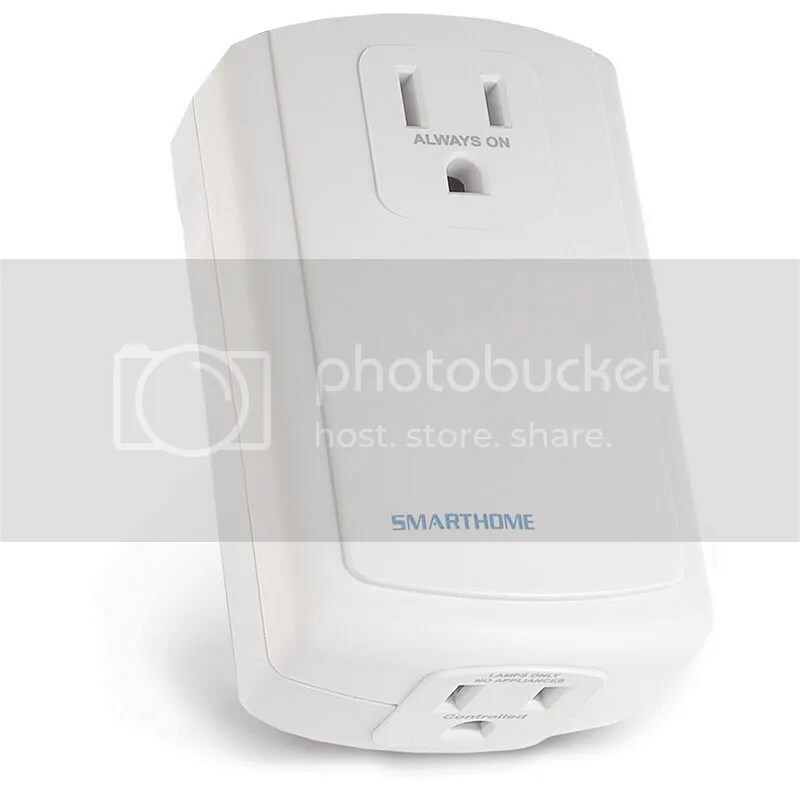 Here’s the specs off of the Smarthome site on how to install them. Basically you replace the existing one and included the neautral as well. I’ll include pics of my next install so you can see how it looks in the real world. Once you get used to it, you can install them in no time! 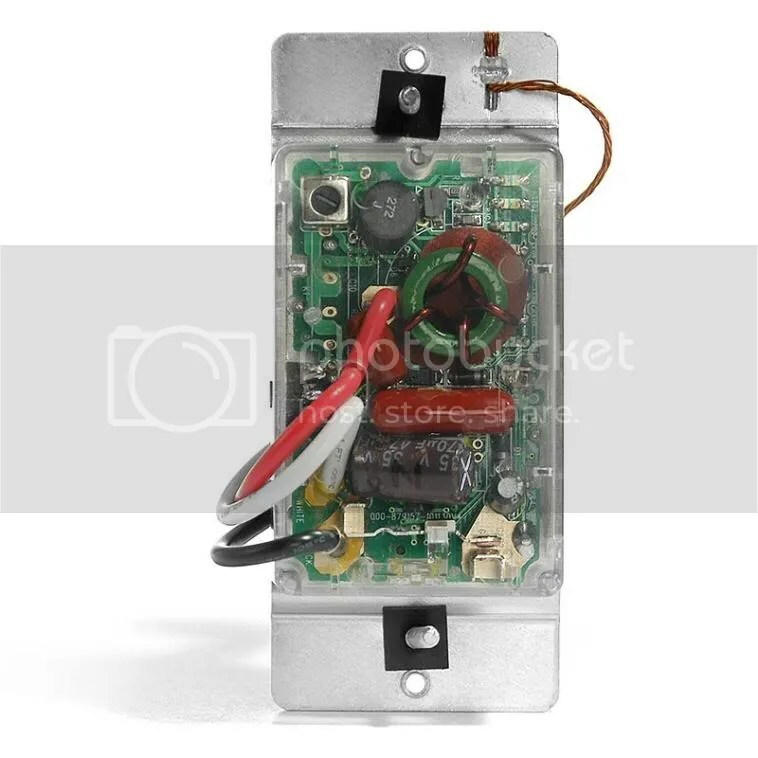 Here is a ‘external’ dimmer device which can dim / turn on /off any device on it. Your lamp would connect on the bottom. And the devices even has a pass thru non-controled plug so you dontloose your outlet. Im stocking up on these for the chirstmas decorations this year! Keep posted part #2 coming up. Now that we got the basic’s lets dig in deeper!